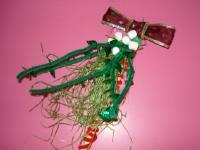 Use this craft to explain the mistletoe tradition to your group. 1. Gather your material. 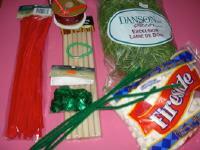 You will need miniature marshmallows (to represent berries), a wooden dowel, green grass-like material, red and green pipe cleaners, small metallic leaves, a green hair tie, and red ribbon. 2. 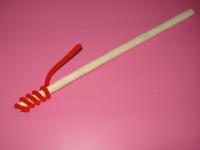 Wrap the red pipe cleaners around the wooden dowel to give it a festive look. 3. 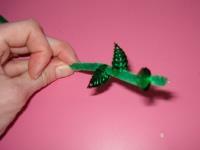 Thread a few metallic leaves onto five green pipe cleaners. The leaves I found at the dollar store had tiny holes at the base of each leaf. 4. 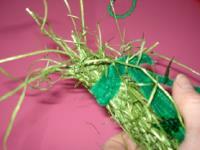 Wrap the top of the green pipe cleaners around a handful of green grass-like material. 5. Use the hair tie to secure the greenery to the top of the dowel. 6. 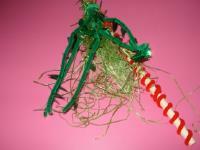 Bend and twist the green pipe cleaners as you wish to represent mistletoe. Glue a few marshmallows at the top to represent white berries. 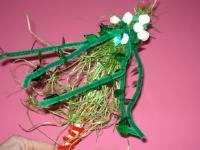 Show children pictures of mistletoe on the Internet so they know what their craft is supposed to look like. 7. Use the ribbon to add a pretty bow. 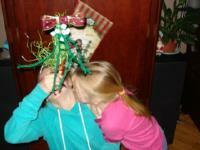 Show children how they can hold their mistletoe above their head to request a kiss from a family member or friend. Trust me, there will be lots of laughing involved...especially among sisters!